Living high, straddling the DC/Maryland line in the most sought after section of Chevy Chase, residents of the Village of Friendship Heights share their neighborhood with fine restaurants, posh stores and shops, and a host of elegant high-rise residential buildings. Tucked into an area of five city blocks bounded by Wisconsin Avenue, Willard Avenue and Somerset Terrace, Friendship Heights is often referred to as the Rodeo Drive of Washington, DC. Here, Life AT The Top is found in taller buildings that offer spectacular views into the City and leafy suburbs alike. Many residents work in nearby offices and broadcast studios, or take the twenty-minute commute to downtown by car or Metro. Some of the finest penthouse properties are found in condominiums at Chase Point, The Willoughby, The Carleton, The Elizabeth, 4620 North Park Avenue and Somerset House. Neighborhood amenities include department stores, as well as numerous boutiques, day spas, a multiplex cinema and other services that cater to your every need. In and around the neighborhood you will find Neiman Marcus, Bloomingdales and Saks as well as Tiffany, Cole Haan, Eileen Fisher, Jimmy Choo, Anthropologie, Ralph Lauren, Bulgari, and Barney’s Co-Op. 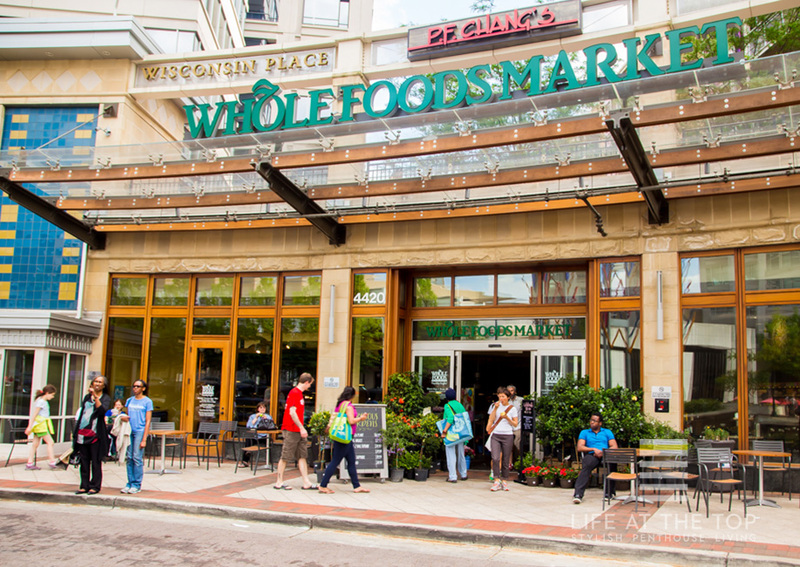 Whole Foods and Giant provide food shopping with specialty stores adding variety. For dining in the neighborhood, The Capital Grille, Clyde’s of Chevy Chase, Cheesecake Factory, PF Chang’s and Maggiano’s Little Italy provide familiar flavor, while local favorites include Indique Heights, Morty’s Delicatessen, Le Chat Noir, Lea’s, 4912 Thai Cuisine and The Tasting Room wine bar. The Village of Friendship Heights provides a free shuttle bus that stops at every residential building, connecting residents with nearby Metrorail, Metrobuses, and Ride-On bus routes. The Friendship Heights Station on the Red Line is located on Wisconsin Avenue. Interested In Owning A Friendship Heights Penthouse Or Luxury Condominium?